If you are looking to buy quality steaks online you’ll want to compare Omaha Steaks vs Butcher Box. Unboxing vids below. The online grocery battles are just starting but Omaha steaks has been in the business of shipping steaks for years. Omaha steaks differs from Butcher Box in that they seem to specialize in one time gift giving whereas Butcher Box is aiming to cultivate a monthly subscription starring “green” grass fed beef. Quality: First, the quality of both are good. Taste is excellent for both. 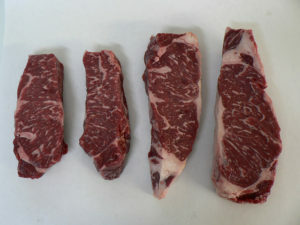 In this comparison the Butcher Box quality is focused on hormone free grass fed beef. Omaha steaks has been selling grain fed beef for one hundred years and, with a lot of marketing, they have developed a respected brand and reputation for quality. They have more recently started selling select grass fed meats with an explanation of some differences. Omaha Steaks also offers a premium level they call Private Reserve. However, I was not able to find any disclosed level of quality for Omaha Steaks. Butcher Box has put it’s main “quality” focus on Grass-fed & Grass-finished Beef, Heritage Breed Pork, and Free-range Organic Chicken that is all certified humane, all free from added antibiotics and hormones. Price: Simply put, the prices for grass fed, humane, no antibiotic, no hormone is significantly more for Butcher Box. They aim for six dollars per meal. Find out more about Butcher Box here and for a limited time they are offering free bacon for life here. Omaha steaks can offer some jaw dropping sales prices (we’ve received the best offers after the first purchase via special offer mailings). The “value packages” they offer can be found for around fifty bucks. They’ll add a bunch of “filler” like burgers, hot dogs, stuffed potatoes, and apple tarts but it’s all great tasting and great looking (we have never NOT consumed the extras. The potatoes and apple tarts are fantastic. Subscription: Butcher Box has you sign up for a monthly delivery box either curated by them or you can pick and choose. You can cancel at any time, but it’s different from Omaha Steaks single purchase arrangement (they will bombard you monthly with sales in the mail). If you are very conscious of your meat sourcing and antibiotic use you’ll find a great service in Butcher Box. Their packaging is even more “eco-friendly.” Butcher Box is shipped in recycled biodegradable material and Omaha Steaks is packed in Styrofoam. Both always arrive solid frozen in dry ice and vacuum sealed. Take a look at the unboxing videos of Omaha Steaks vs Butcher Box both below. If you are looking for good quality and taste often at a big value I recommend Omaha Steaks. Both are great ideas for gifts too. Snake River Farms is one of the only Competitive BBQ meat providers we’ve found. If you need American Kobe (Wagyu) brisket they are the most trusted source. They’ve also created a Snake River Farms Wagyu Brisket club for best pricing. Spend $99 and Get Free Rack of Kurobuta Pork Spare Ribs and Free Standard Shipping at Snake River Farms, code SPARES18, exp 12/31.